AirPura V600W (V600-W) VOC Removal Central Air Purifier - an Efficient True HEPA and Specialty carbon AirPura air purifier that provides continuous whole house air purification from microscopic allergens, dust, VOCs and specific chemicals through the air duct of a house's central ventilation and air conditioning system. 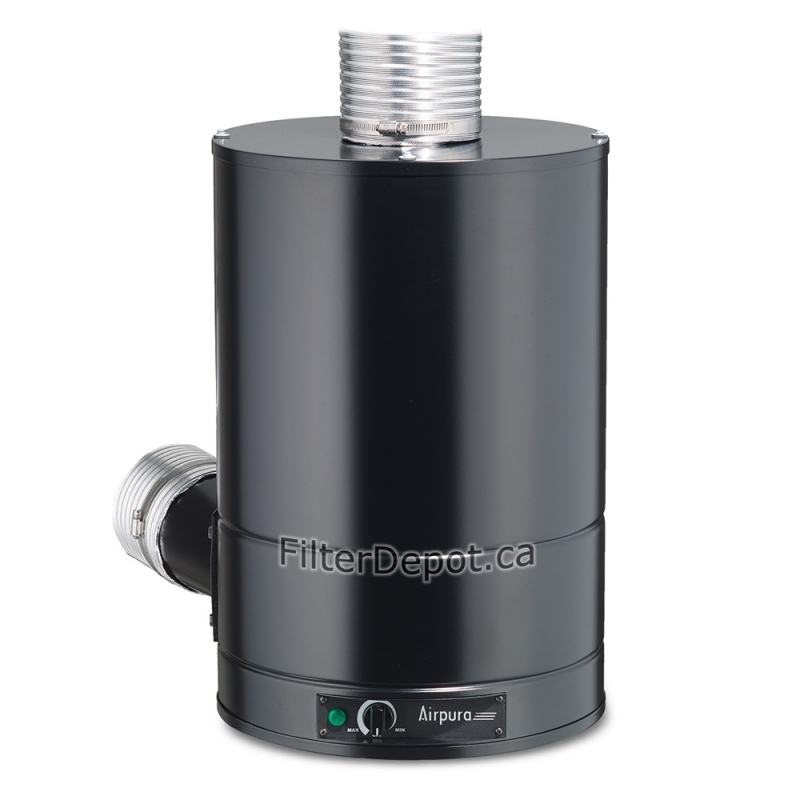 AirPura V600W VOC Removal central air purifier is an equivalent of the AirPura V600 portable air purifier. It employs similar size and efficiency True HEPA for trapping all microsopic allergens and dust, and large filter canister with specialty adsorbent for effective removal of VOCs and specific chemicals. However, unlike the portable air purifier, the AirPura V600W Central air purifier is connected to the air duct of a central home ventilation and air conditioning system (HVAC / furnace), and therefore purifies the entire volume of air distributed throughout the whole house. When to Use AirPura V600W Air Purifier? AirPura V600W central air purifier should be used for trapping allergens and dust along effective removal of VOCs and toxic chemicals released by new furniture, new carpeting, fresh paint vapors, vapors from varnish, oil paints, off-gassing from office machines, pesticides, household cleansers, perfume, VOG, etc. 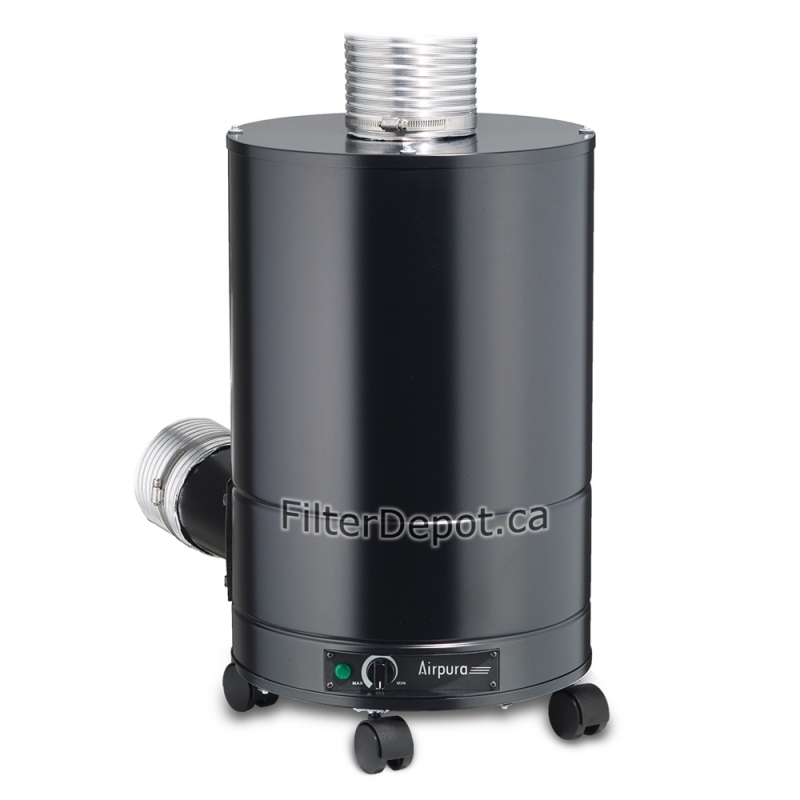 AirPursa V600W employs standard size 2-inch deep True HEPA filter to trap from the air over 99.97% of all microscopic airborne contaminants down to 0.3 micron in size a provide a superior level of protection from lung damaging dust, allergens, cigarette smoke, etc. 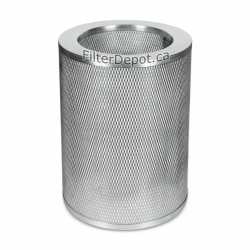 The filter canister features a massive amount (18 lbs.) of specialty adsorbent. The specialty adsorbent is a blend of coconut shell based activated granulated carbon carbon with special additives to provide fast ad effective removal of VOCs and specific chemical substances such as: ammonia, formaldehyde, most other specific chemicals. 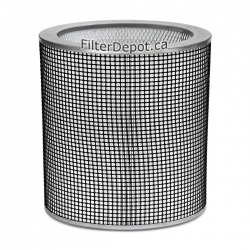 The Polyester based Pre-filter is the the first stage of the air filtration system of AirPura V600W central air purifier. 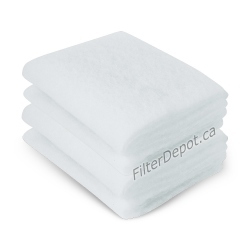 The pre-filter traps most of the larger visible dust and dirt particles and protects the fine True HEPA filter from faster contamination and extend its lifetime. 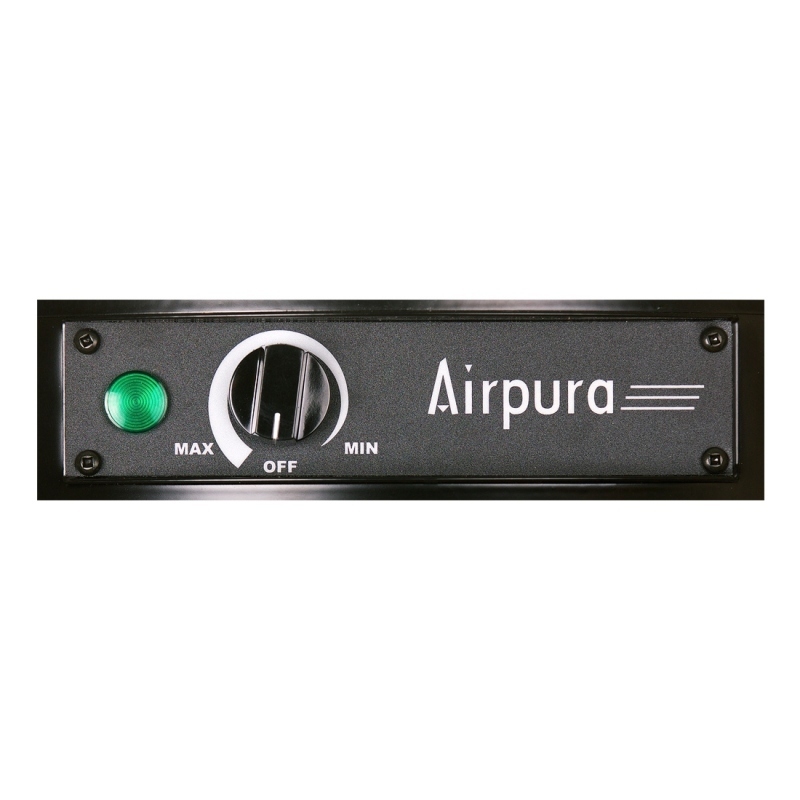 AirPura V600W air purifier employs powerful, yet energy efficient Motor/Fan assembly with variable speed control rated at 560 CFM - the same one used to power the whole lineup of AirPura portable and central air purifier. The variable speed control allows users to adjust the air filtration rate by selecting the most suitable speed setting for any particular air cleaning application or air cleaning power. The Standard configuration of AirPura V600W air purifier is for North American power supply of 110-120V, 60Hz for Canada, USA, Mexico. AirPura V600W air purifier features durable, impact resistant fully enclosed the all metal housing. 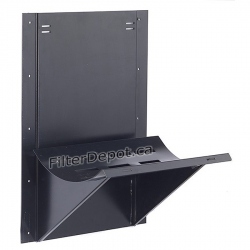 To ensure simple connection to the air duct, the AirPura V600W central air purifier is equipped with standard 5-inch hose attachment for both Polluted air intake (top panel of the unit) and Clean air outlet (bottom of the unit on its side). 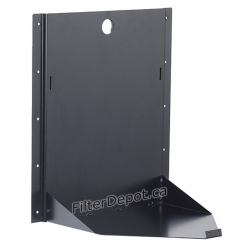 The AirPura V600W used to remove the polluted air at a source can be equipped with 4-Wheel casters on the bottom panel to provide a required mobility at no Extra Cost. AirPura V600W central air purifier comes with the most comprehensive limited manufacturer's warranty in the air purifier industry that gives the AirPura air purifier owners a Peace of mind. The AirPura V600W whole house air purifier can be installed Free Standing or installed on the wall using the optional Wall brackets. AirPura V600W central air purifiers are shipped Free of charge by FedEx Ground delivery service in Canada and the Continental USA.